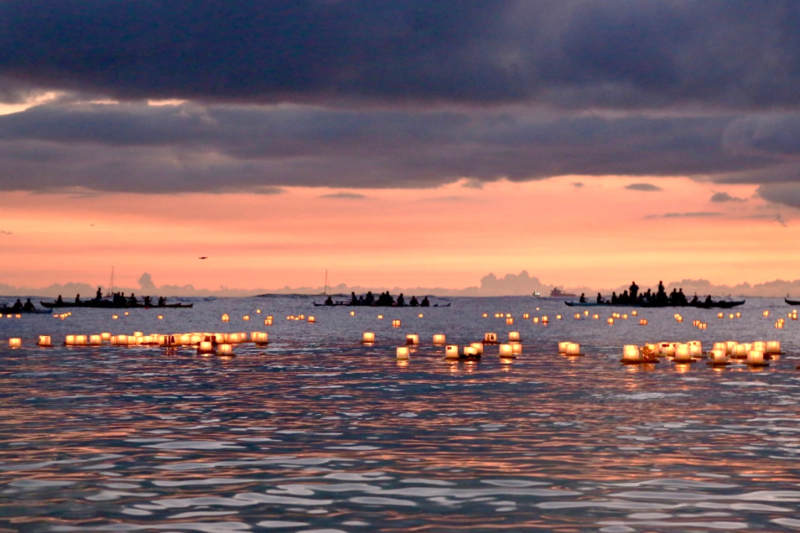 Each year on Memorial Day, crowds gather in Honolulu, Hawaii for the Annual Shinnyo-en Lantern Floating Ceremony. At sundown on the shores of Ala Moana Beach Park, tens of thousands of people watch a service presided over by Shinso Ito, Head Priest of Shinnyo-en, followed by the release of lanterns onto the adjacent bay. The Lantern Floating is a traditional Buddhist ceremony, in which participants float lanterns down a river or in the ocean. This symbolic ceremony is conducted to honor those who have lost their lives in war or by other unfortunate events or disasters, and to honor loved ones who have passed away. It also carries with it a message of hope toward a harmonious and peaceful world. It is also a collective experience where families, friends and even strangers extend warmth, compassion and understanding to support one-another. For more information about Lantern Floating Hawaii, please visit the Shinnyo-en website, and read our article about the 2017 Ceremony with a video at the end of the article.